Thank you for contacting us via Twitter. I've looked into this with our fish buyer and they've advised that at Waitrose we have been working to a responsible seafood sourcing strategy for over 15 years and have made a commitment that by 2017 all our fish and seafood will be independently certified as responsibly sourced. Waitrose recognises a number of independent Standards for wild caught fish including the Marine Stewardship Council and the Food and Agriculture Organisation based Responsible Fisheries Management. In line with our policy to only buy independently certified fish, our South African hake is from the Marine Stewardship Council fishery and is certified as sustainable. However as one of our Waitrose Way commitments is to Champion British products selling UK Hake seems an obvious choice, especially as the stocks appear to be healthy. Should the fishery gain independent certification as being responsibly managed we will of course introduce this fish to the Waitrose assortment. I hope this helps with your query but should you have any further questions please let me know. This only highlights the dilemma and complexity of an industry where MSC certification has now become the holy grail and/or stick by which to beat others - getting certification is not that straightforward - and worse still, just because a fishery does not have MSC accreditation does it mean stocks are unhealthy. The same problem exists with fish line caught fish - where the customer would be led to believe that line caught fish are to be preferred to those without that label - it's just not that simple! Supermarkets obviously feel driven to do their PR bit and say how wonderful they are to use MSC accredited fish - even if home grown fish like hake would be their preferred choice! Maybe it would be in the supermarkets interests (as M&S did) to help fishermen achieve MSC accreditation for fish species like hake without feeling they are doing the wrong thing. Those that fish in the south west must be hoping that MSC accreditation is forthcoming for their hake sooner rather than later - especially as they can do the maths and see that the supermarkets selling hake at £16+ a kilo is 10 times greater than the 31.60 per kilo they get on a bad market! I called into Waitrose at Saltash earlier they had some very nice looking Hake loin from South Africa of all places on display, the bloke on the counter reckoned it was a bargain at £15.99 a kilo when I tackled him about it. All the hard work being done by the likes of Alan Dwan skipper of the Ajax to promote Cornish hake and outfits like Waitrose continue to stab us in the back in our own country. The question must be asked... aren't there enough starving millions in Africa to eat their own hake? 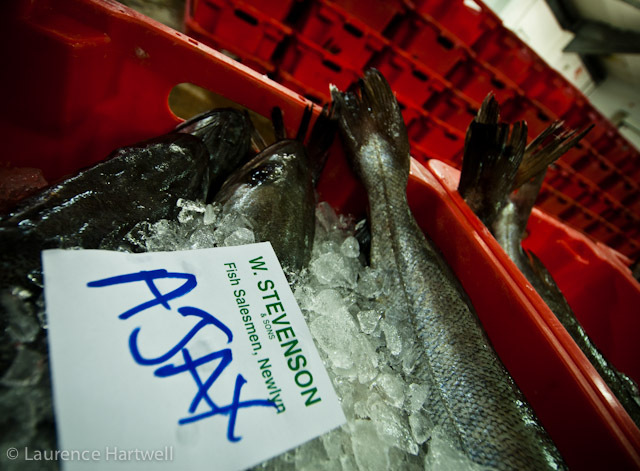 BE VERY INTERESTING TO HEAR FROM ALAN WHAT THE AJAX HAKE IS CURRENTLY MAKING. I know the fish trade is global but flying hake 10000 miles when the finest quality hake is available in Cornwall at low prices highlights the madness of supermarket supply chains. CORNISH SHOPPERS PLEASE ALWAYS DEMAND LOCAL PRODUCE IT IS SO EASY IF YOU JUST REFUSE TO BUY ANYTHING IMPORTED WHEN IT IS ACTUALLY AVAILABLE LOCALLY MUCH FRESHER AT A LOWER PRICE. Follow the story here or listen to Radio Cornwall and Lawrence Reed at lunchtime. Cod Boxes - Closed cod season in the Bristol Channel and off Ireland. The shaded boxes are closed to all boats fishing for cod - let's hope the map reading skills of cod are up to the task - the eastern-most box is around 3200 square miles of ocean closed off to cod - do they get updates from the MMO?